As some readers may know I am involved in a mosaics project working with special needs people at the Ballarat Neighbourhood Centre. The intention is to create a sensory garden, and within the garden there will be mosaic garden pavers and a wall mural. It began two weeks go with planting some sensory plants in the garden such as rosemary, mint, sage and thyme. The following week we researched and chose designs. We transferred them onto larger sheets of paper the same size as the pavers and coloured them with the colours everyone wanted to use for their mosaic design. This week we began to lay and glue our tiles to the mesh we are using to mount the designs onto the pavers. This is a great way of working because the designs we completed last week can be placed under the mesh and easily followed when applying the tiles. We are using glass tiles for these pavers, rather than ceramic, because being on the ground in a gravel path they may receive a little foot traffic and gravel debris. If the tiles get a little scratched this will be less noticeable as the colour of the glass goes all the way through the tile as opposed to ceramic where the colour/glaze sits on the surface only. We will continue laying our design for the next sessions, and then after the break it will be time to mount them on the pavers. 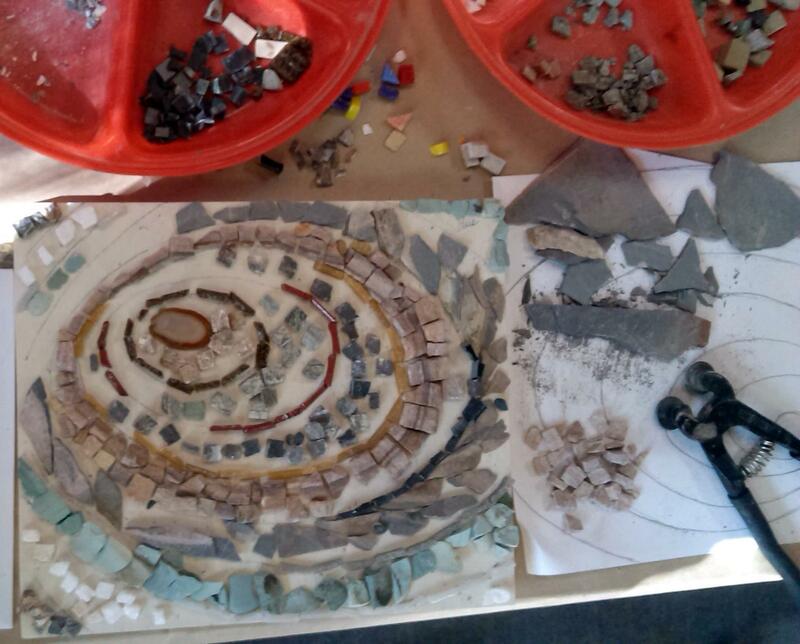 This Sunday I am not in my studio – I am participating in a mosaics workshop in someone else’s studio! I am working on a project with the Ballarat Neighbourhood Centre to create a sensory garden for the Centre grounds. This is a project designed for the special needs group who meet once a week at the centre, and I am the artist on board. My role is to work with the group on some mosaic components for the garden – at this stage each person will create a mosaic paver and then the group will work together on a wall mosaic. 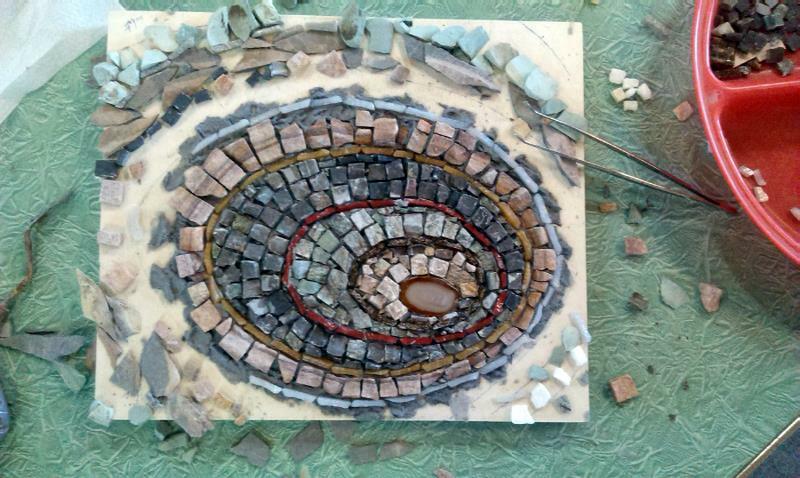 I had dabbled in a little mosaics many years ago, and so a refresher was on the agenda. The Neighborhood Centre was lucky enough to receive a Regional Arts Victoria grant, and part of this was allocated to a professional development workshop. 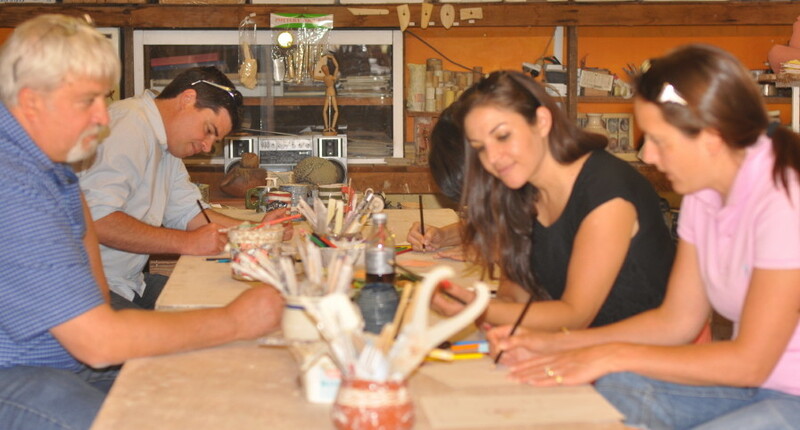 The workshop was run by well known mosaic artist Helen Bodycomb at her studio at Lot 19 in Castlemaine. Lot 19 is an amazing artspace in the Central Highlands of Victoria comprising studio spaces, an outdoor stage, an art gallery suitable for exhibitions, music, marionette theatre, performance, and film, and an outdoor sculpture park. The workshop took place over the weekend, with Monday being an open studio day for participants to finish any works without formal tuition, though Helen was on hand for any questions. I attended the workshop with the project manager from the Neighbourhood Centre. My main focus for the workshop was to nut out the best way to make the pavers with the group… the project has a garden theme, so bright simple designs were in order, with a minimum of tile and/or glass cutting – keeping it simple and straightforward to cater for individual group members abilities and also the project timeline. By Sunday lunchtime a prototype paver was made, with a few small designs being experimented with, for those unable to complete a whole paver. The design still needed to be mounted on the paver and grouted, but the design, dot mounted on fibreglass mesh, needed to dry first. 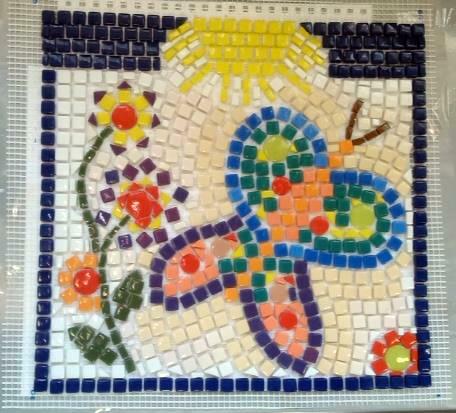 So after lunch I was able to begin on a mosaic design of my own. As regular readers will know, most of my sculpture and artwork is organic and abstract, so this is the direction my mosaic design also followed. I decided to work mostly with stone divided up into section defined by rows of glass. I drew my design first and then transferred it to my mounting board using carbon paper. By the end of Sunday I had most of my design and layout completed so that Monday could mostly be spent finishing the paver prototype and then cementing my stone design onto the board. It was great to have the opportunity to go back a third day and tie up the loose ends. The paver design was cement glued to the paver, but couldn’t be grouted until fully bonded – so I will do that tomorrow. By the end of Monday I had almost finished my organic mosaic and was able to bring home the extra materials I would need to finish it, so stay tuned for a completed image soon. And to finish off, some pics of me at the workshop! I’m not working on anything specific this Sunday so today’s visit is a bit more general, looking at the day to day stuff that I do in the studio. As some readers may know I also teach classes and workshops from my studio ( I also visit schools and businesses for workshops), so today I unloaded the kiln from a firing I did a couple of days ago and reloaded it with a bisque firing, which I then fired. 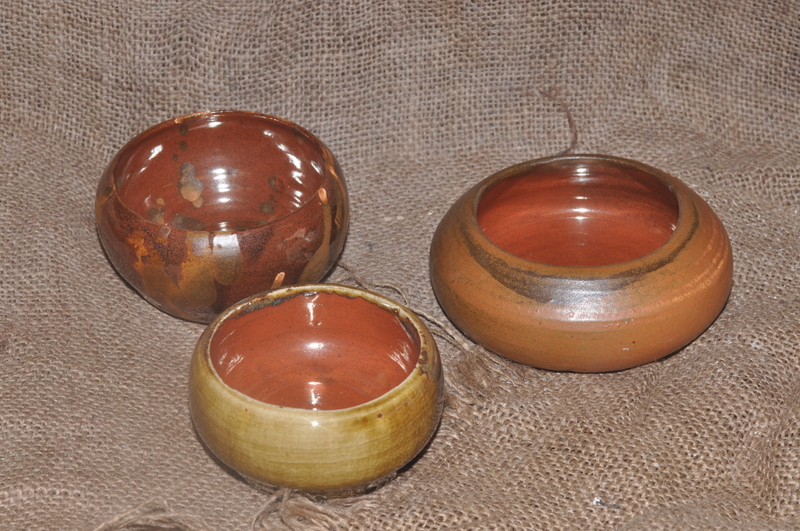 A bisque firing is the first firing in the ceramic process, which hardens the clay body so that is able to be glazed – it is less porous and easier to handle without breaking. Most of the work in the kiln was students, though I did put in some terracotta beads and marbled pendants I recently made, plus the “Made by Nature” series, which was the subject of a Sunday Studio Visit post a couple of weeks ago. I also did a bit of marketing – Facebook, Twitter & Google+ – it can be so time consuming when you are self employed! I also have a poetry and drawing blog …. so today I wrote a poem for that and began a drawing… the drawing began its life as a ‘join the dots’ from a previous drawing I did in my journal, which is made of handmade paper. The previous drawing was created using permanent ink pens, which are kind of like ‘posh’ textas which can bleed on unsized paper. So some of the marks from the previous drawing bled through to the next page, which I then used as a starting point for todays drawing…. Apart from that it has been a gorgeous weekend here in Dunnstown with the amount of birdlife being mindblowing…. Parrots, Kookaburras, New Holland Honeyeaters, Wattle Birds, Blue Wrens (& a koala) and the family of magpies currently living on our property – two parents and three babies!! They are so amazing to watch and come up really close without worrying about us at all, which I love that they don’t see us as a danger, not even Eddy (the rescue dog) …AND so cute to see that alot of the bird life is drinking from the water feature we installed in the garden two years ago – yes, handmade by me!! 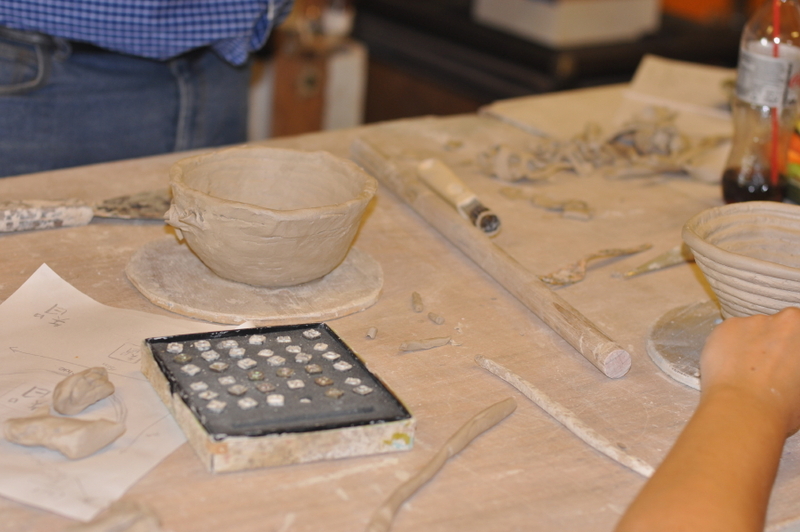 This Sunday afternoon there is excitement happening in the studio – I have been running a pit firing workshop!! Yesterday we prepared, loaded and fired the pit, and this afternoon we unloaded, cleaned and polished the resultant pieces – which were fantastic!! I won’t say too much as I will be writing a more in depth post with lots of pics during the coming week…. so for now a few tempting pics…. enjoy!! Hello Fellow Bloggers!! Apologies for being so absent lately, it has been a hectic few months!! (and yes there is a reason besides Christmas which will be announced soon). I have been missing in action both in posts and visiting other blogs and I am hoping to get my act together soon! 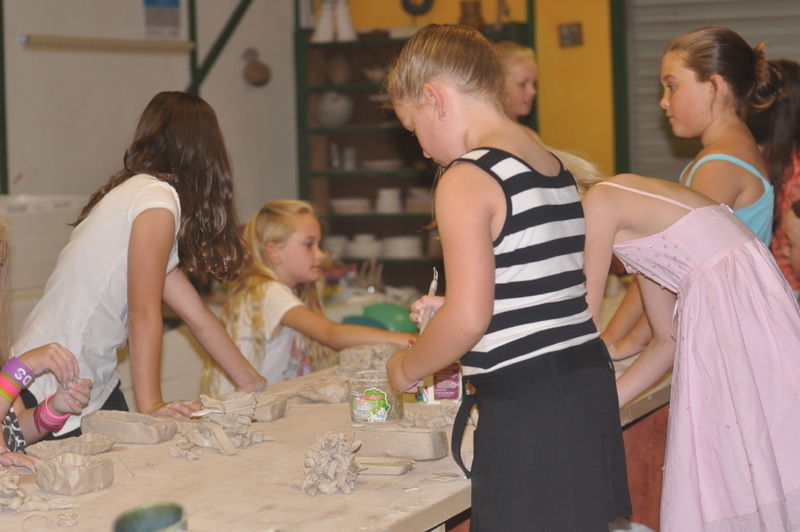 In the meantime I am running some school holiday workshops – via my ClayMotion business from my studio in Ballarat. Ballarat is a wonderfully central location for people to visit from Melbourne or other Central Highlands regions – and if the kids do a morning class you have the afternoon to explore other stuff in Ballarat such as Sovereign Hill, the Gold Museum, the MADE Museum or junk shops and cafes – or stay the weekend and explore everything!! Feel free to share with creative kids – or kids that don’t realise they are creative as yet!! ClayMotion classes and workshops for children are designed to encourage individual creativity, fine motor skills and tactile development, all of which are important skills to hone in our current modern fast paced technological world. Being able to relax in the environment of creativity is an important factor to maintain balance in a “results” based modern society – especially for children. 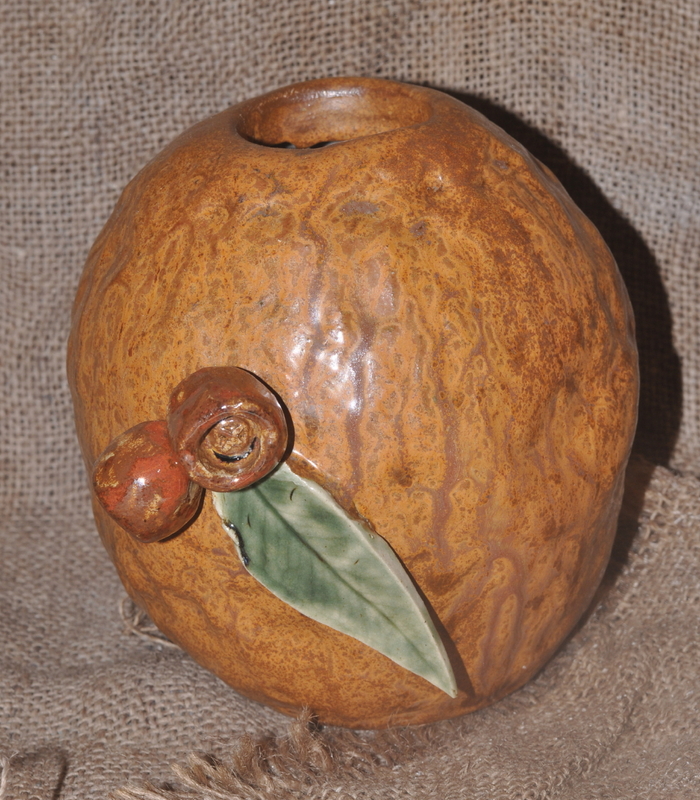 Wednesday 15th January 10-12noon $30.00 including materials and firing. 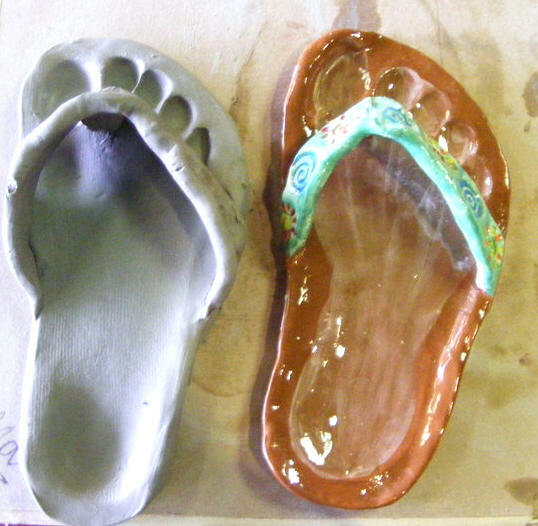 This project is a tactile project encouraging the children to ‘squelch’ their feet in the clay to make imprints for a set of clay thongs. Children will roll out clay, imprint their feet into the soft clay, cut out the shape of their feet, and make their imprints into thongs. The thongs will be decorated using brightly coloured slips. Parents will be contacted when the thongs are fired and ready to pick up. 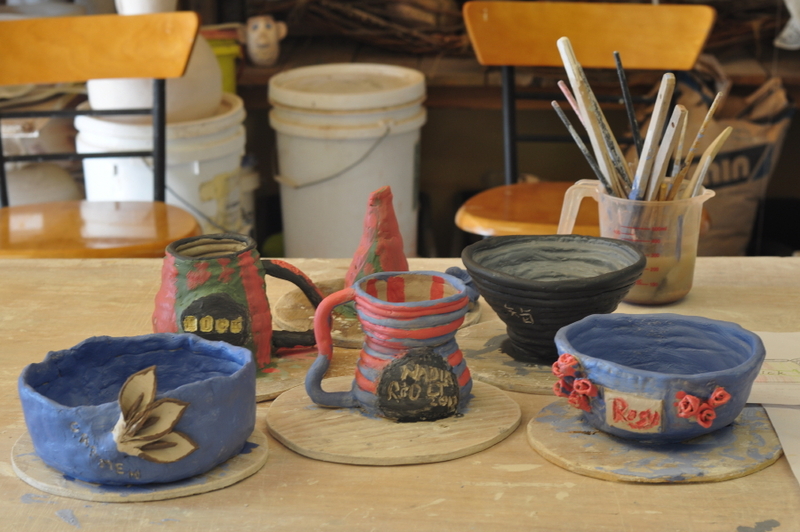 Wedneasday 22 january 10-12noon $30.00 including materials and firing. This project is great for children who like to grow things – herbs, cactus or even the old fashioned onion tops! 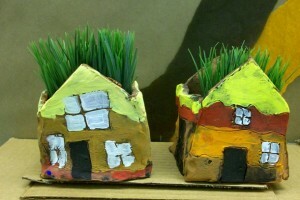 Children will make clay houses from rolled out slabs of clay which will have no roof so that herbs or cactus can be planted into the house. Houses will be painted with coloured slip. Teambuilding programs are a great way to build upon employee communication skills, company morale and overall productivity. CREATIVE teambuilding is an even better way to generate listening skills, empathetic skills and thinking skills. Todays creative teambuilding workshop with Mars employees was a great example of this concept. Though small (5) , they were a group used to working with each other, being in a research and design team. Sometimes however, such closeness can germinate negative elements such as familiarity and complacency. Creative teambuilding can help to overcome these workplace issues through fostering an environment of listening and co-operating. By describing and communicating an individuals vision of what a project – in this case a coffee cup – should look like, participants are encouraged to increase their awareness of another individuals personal preferences – this develops a number of skills in the group participants such as listening, empathy and bonding. The project must be completed in a certain time frame which also focuses on time management skills within a studio environment and enables a team member to put themselves in another’s place, and developing workplace skills that include direct one-on-one discussion of aesthetic preferences. The general group communication is in an informal relaxed environment, enabling team members to realise their visions which helps to extend and consolidate understandings of fellow workmates, which in turn creates a more thorough understanding of workplace communications and networkings by increasing abilities to listen, and be considerate to other’s needs within the team. Teambuilding sessions are held at the ClayMotion studio which is situated 10km from Ballarat and 100 km from Melbourne, Victoria, Australia. The studio sits on a peaceful 10 acre property providing a serene getaway for creative development. Was you New Years Resolution to find a new hobby or to relax more or learn a new skill or get more “arty”? 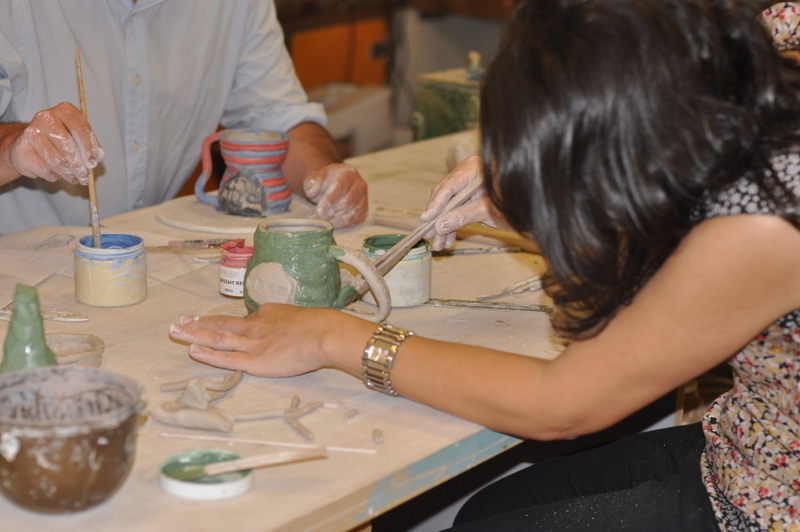 Enrolling in a ceramics/pottery course could be the perfect solution! And if that wasn’t your New Years Resolution, it would be fun to do anyway! 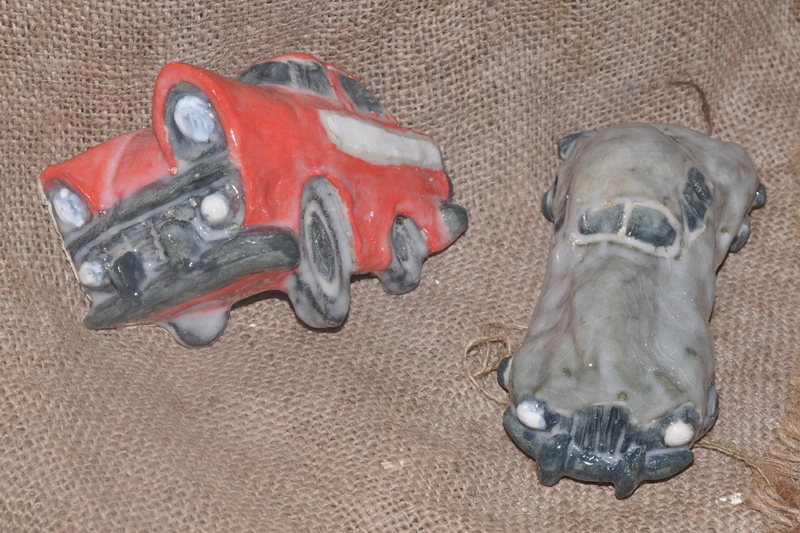 Clay is a highly tactile medium, so it is a great way to express feelings, de-stress and be creative – it also has far reaching therapeutic outcomes both psychologically and physically. 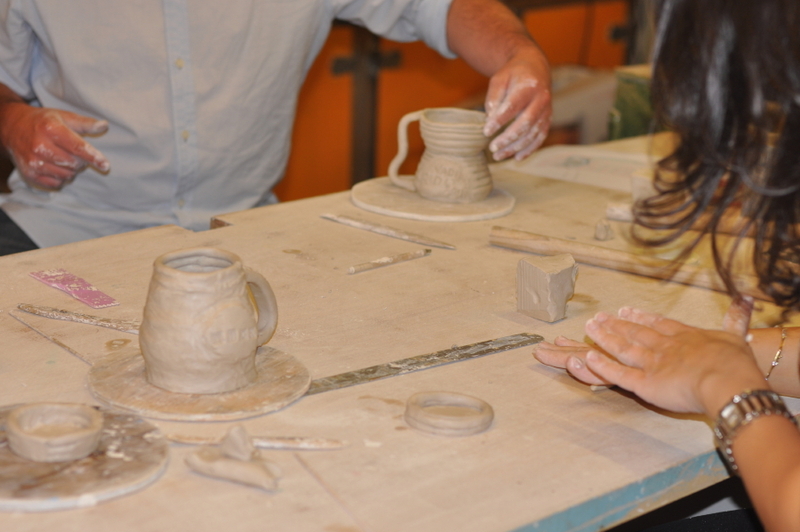 Classes are available for adults and children which run with the school terms – dates and times can be found on the ClayMotion website. 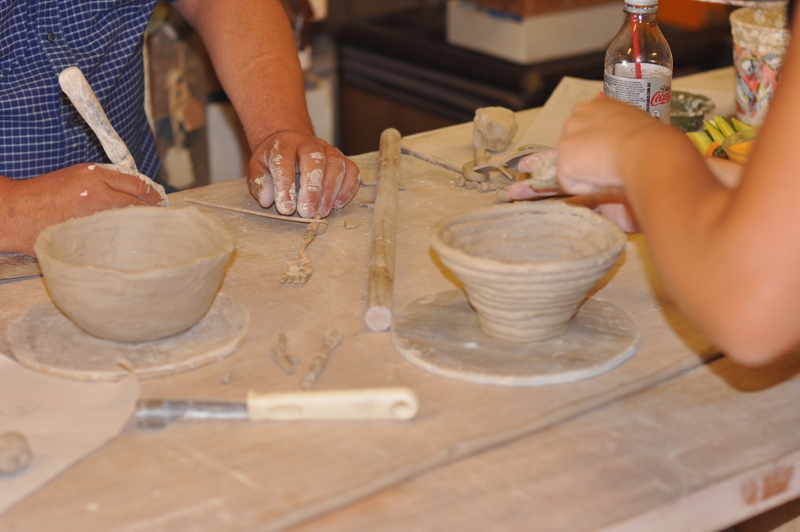 Classes are suitable for beginners through to advanced, and wheelthrowing, handbuilding and sculptural techniques are taught. 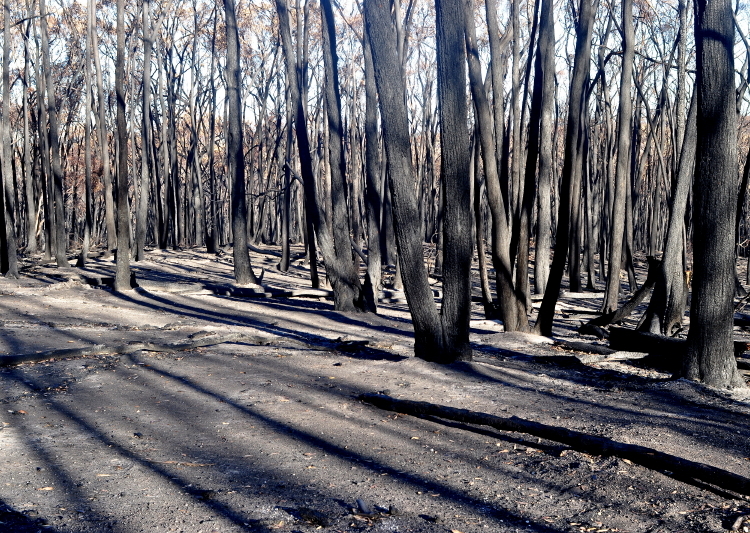 Outcomes include set projects and self initiated. TERM ONE is only one weeks away and I have had lots of enquiries over the summer break, so don’t miss out! BOOK ONLINE NOW to secure your place in classes or workshops. 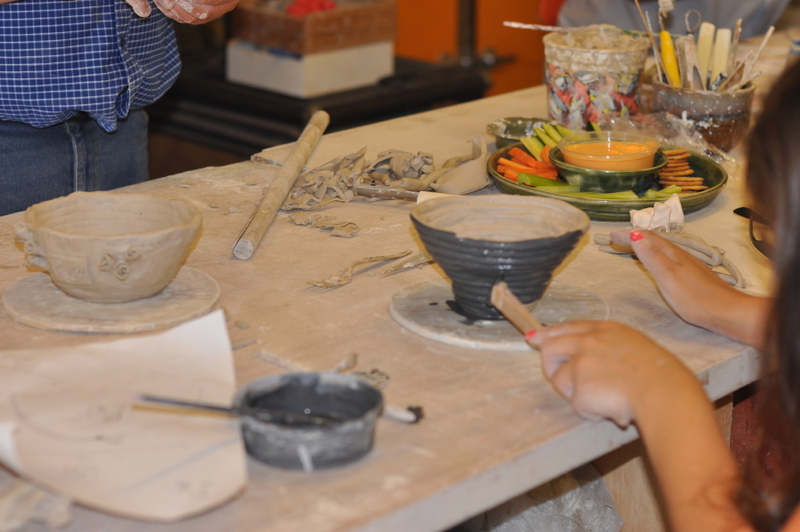 Workshops, corporate teambuilding, mothers group sessions and family workshops are also available at the ClayMotion studios – see all the information on the website.